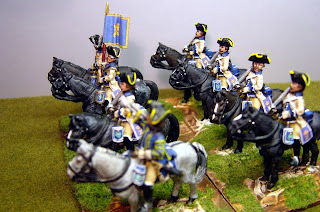 My next three posts will all be on Hessian cavalry of the SYW. These pictures show the 'horse' regiment Prinz Wilhelm/Erbprinz after the uniform changes made in 1761. In previous posts on the Hessian foot, you will, perhaps, recall that big changes were made after January 1760 when the Landgrave Wilhelm VIII died and was succeeded by Friedrich II. The army, which already had a very distinctive Prussian look to it, was now made into a mini-carbon copy. The old-one battalion regiments of foot were made into small two battalion regiments and the horse made into Cuirassiers, but without cuirasses. 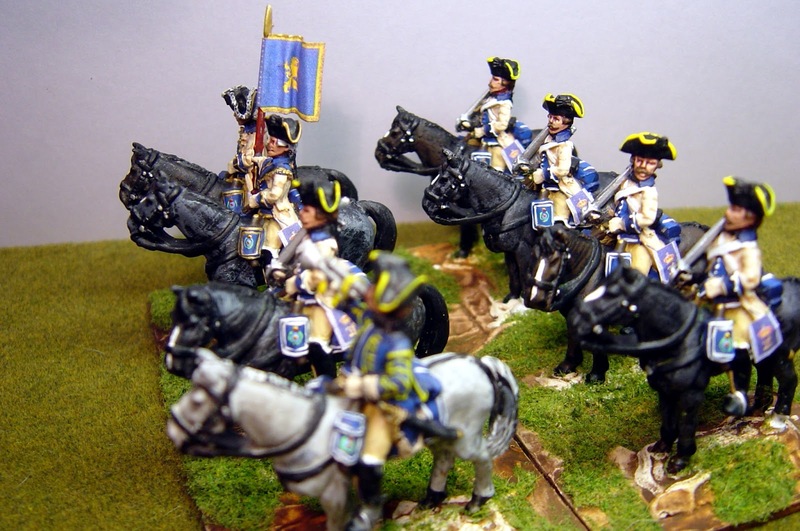 This then causes some difficulties when wanting to represent them on the wargames table as no manufacturer makes a cuirassier figure without a cuirasse. These figures are from Eureka's lovely Saxon range and they are excellent sculpts with very little cleaning needed. But they are rather on the small size if you compare them with either Foundry or Front Rank cavalry. The other problem is that there is no sabretache shown and I have added paper sabretaches which you can see in the pictures. 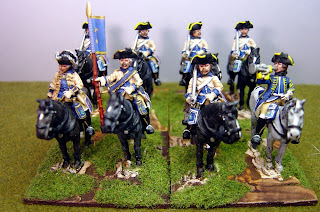 I'm giving some thought to starting a new blog just on the subject of the Hessian Army of the SYW but please give me your feedback on whether you think that might be a good idea or not.